One thing is immediately clear – the BlackBerry Z10 is far removed from the Storm, both in terms of hardware and in software. The hardware adopts the standard monoblock design of most current smartphones. Its shell is made of plastic, but feels solid in the hand. It’s not very compact though – it’s almost the size of the LG Optimus G, a phone with a screen that’s a half inch bigger. Anyway, we like that BlackBerry didn’t fall in the same trap that some Android OEMs fell and think it can get away with a non-user-removable battery, no microSD card slot and no proper TV out like the iPhone does. The screen on the Z10 measures 4.2” in diagonal and has WXGA resolution (768 x 1280, the same as the Nexus 4 and Nokia Lumia 920). 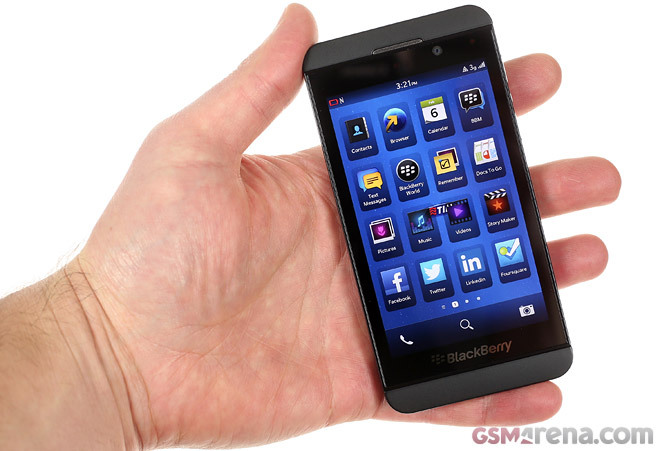 It has 355ppi pixel density, making it the biggest and sharpest screen on a BlackBerry phone by some distance. Unlike the BlackBerry Torch, the Z10 doesn’t try to mate the touchscreen and hardware QWERTY experiences. That’s left for to the Q10. The BlackBerry Z10 relies on an advanced on-screen keyboard that has taken some ques from custom Android keyboards like SwiftKey and scans your messages to learn how you type. Suggestions are very advanced – they work with up to three languages at once and will try to guess the whole next word before you even start typing it. The BlackBerry 10 OS differs from the three popular touch-only OSes – iOS, Android and WP8 – in how much it relies on gestures. It reminds us of MeeGo and the upcoming Jolla in this regard. Instead of having you aim for particular UI elements, BlackBerry made the major operations accessible through a gesture. It might take some getting used to, but it works towards their goal of making the Z10 nicely usable with just one thumb. One of the most powerful features of the new OS is the BlackBerry Hub – check out the video below to see it and the rest of the cool new features in action. This little detour off our review process is over, time to get back to pocking both BlackBerry’s new OS and flagship phone. Special thanks to Basatne Electronics for providing the review unit!